The Minecraft video game is all the rage lately, especially in my house. 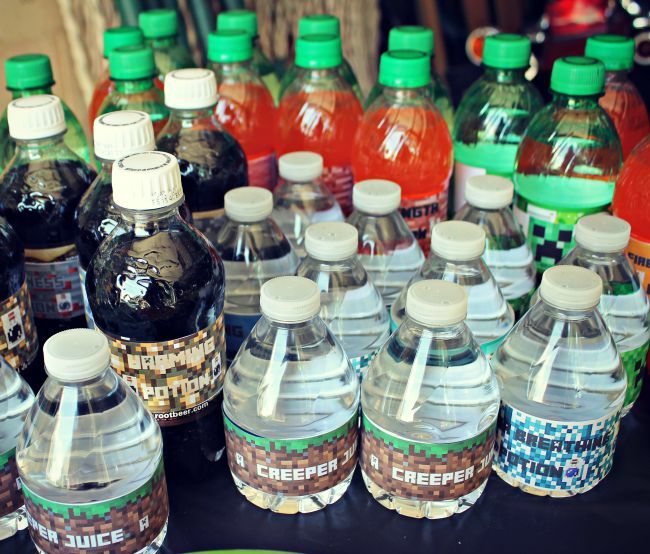 This summer we hosted an epic Minecraft Birthday Party to celebrate Max’s 10th birthday. Ella and I spent hours and hours scouring Pinterest as well as some really awesome blogs to put together the perfect party for Max and his friends. There are so many ideas out there that at one point I had to just raise my hands in the air and walk away from the computer. 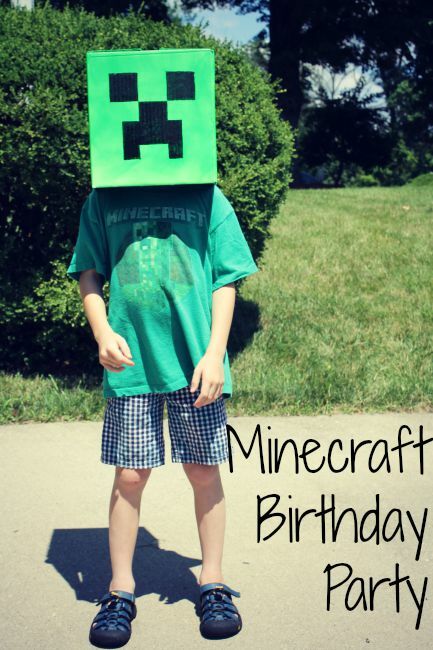 Eventually though we picked out some cool ideas for his party. 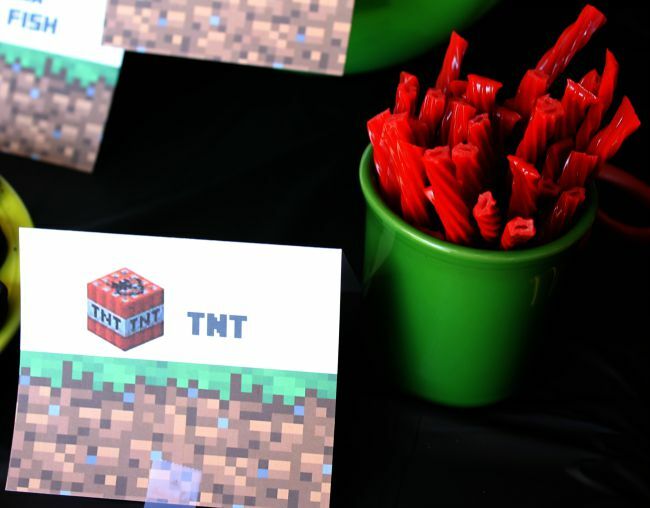 It felt like we went way overboard on decorations, food and games but in reality I think there are approximately one million ideas out there for Minecraft Parties, so honestly we could have done so much more! 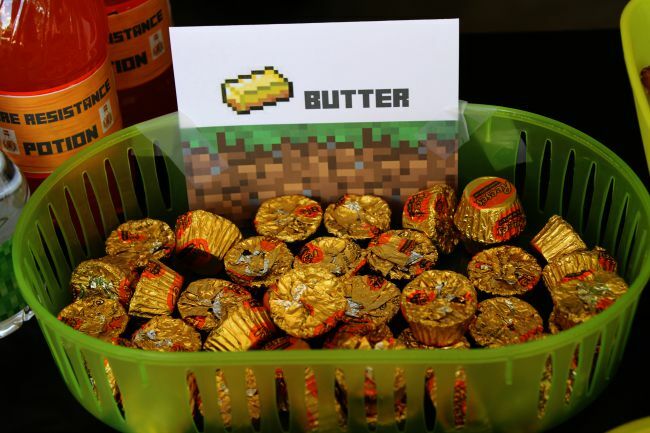 I’ve put together a list of resources and ideas we used so that if you have a Minecraft party in your future maybe you can find some inspiration here! Also, be sure to check out my Minecraft Party Ideas board on Pinterest. The Invitations ~ We were planning this party at the last minute, so the invitations had to be simple. 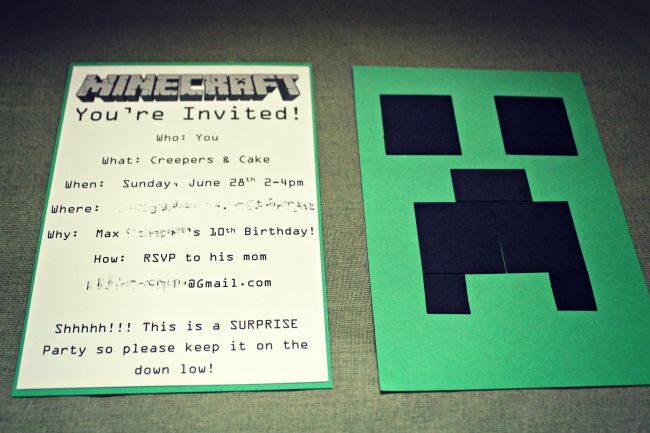 Despite the rush I still wanted them to be unique, so Ella and I used a few ideas we found online to come up with this invitation, which I printed out and adhered to green paper, and then Ella created the faces. I think they turned out pretty cool! Scavenger Hunt: To entertain the boys at the beginning of the party we had a quick and easy Scavenger Hunt for them to do. We found the printable Scavenger Hunt at Penny Pinchin’ Mom (she also inspired the goodie bags, see below). At the end of our Scavenger Hunt we changed things up and instead of finding goodie bags the boys found water guns. And that’s when the madness began. 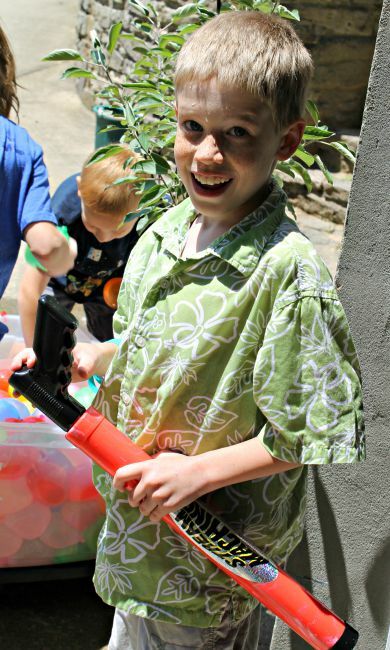 Water Play: Our Minecraft Birthday Party was also a “water fun” party because it was HOT outside. 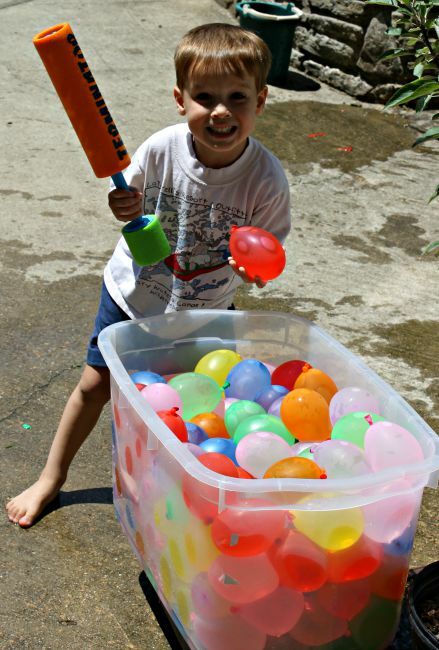 We had considered making swords** for the kids to use, but felt like water guns and water balloons was a better route on a hot summer day. 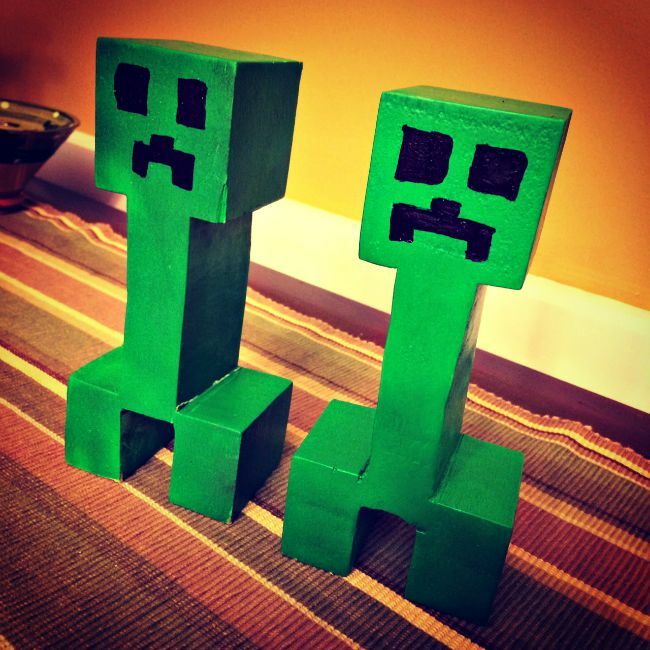 Since we didn’t have time to make the swords Michael created a pair of awesome wooden Creepers that we gave the boys to play “Capture the Flag Creeper” with. 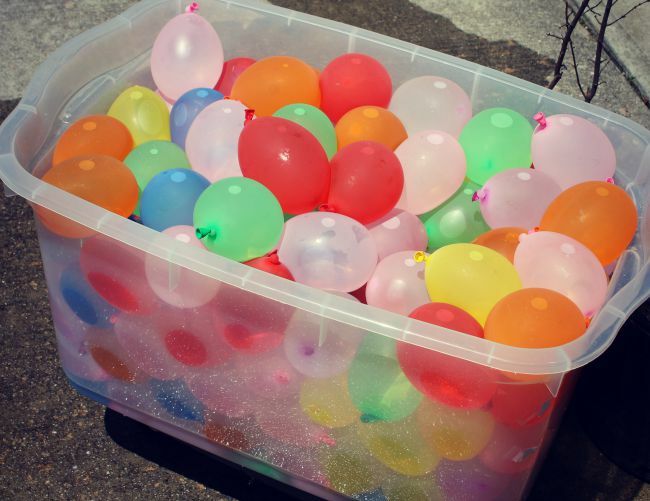 We also filled up about a million water balloons. What happened next was an all out water war. 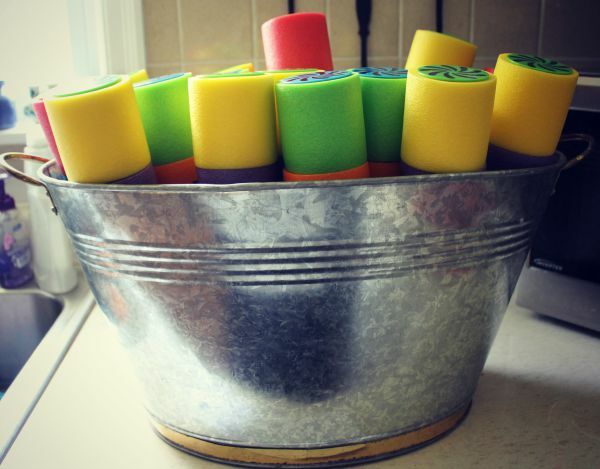 The kids had so much fun, and nobody was safe…I ended up sopping wet. And I don’t have many pictures from the battle because I was too afraid to bring my camera outside. Check out the Frugal Family Times for ideas on making wooden swords, if we had more time in preparing the party Michael had wanted to make these. They also have a cool idea for a Minecraft themed music playlist! The Goodie Bags: Ella and I had a lot of fun putting together the goodie bags and all of the kids seemed to get a kick out of them. These were relatively inexpensive and took no time at all to put together. 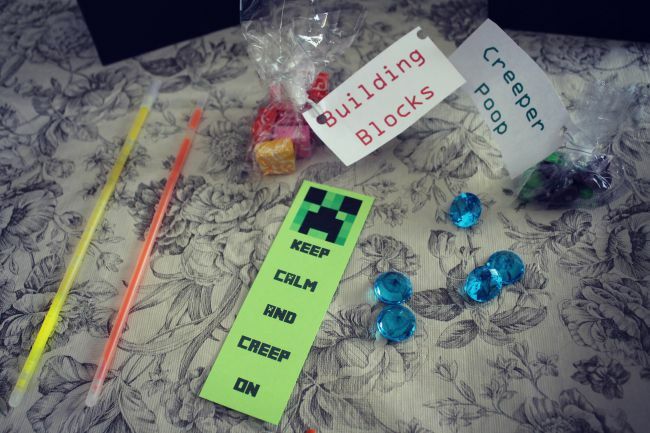 They included Creeper Bookmarks, Creeper Poop (purple and green Skittles), Blue Diamonds (plastic gems from the craft store), Building Blocks (Starburst Candy) and Glow Bracelets from the Dollar Store. We bought black paper bags from Michael’s and used printables from Your Party Solved to decorate the bags. Thanks to Penny Pinchin’ Mom and Mind Body Soul Essentials for the cool goodie bag ideas! Minecraft Party Food: Planning the menu was probably the most exciting part of the planning for Ella and I. We pored over ideas on Pinterest, and ended up finding tons of ideas on the Mind Body Soul Essentials blog and purchasing our food printable cards from Your Party Solved. 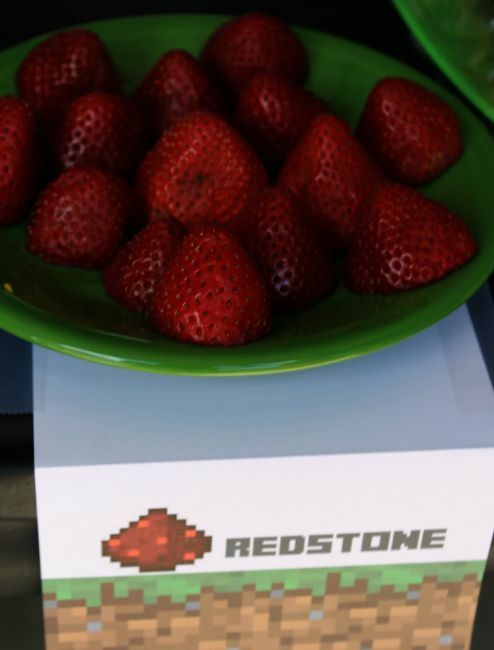 These food cards and labels really did make the food table awesome. Please excuse how messy the table looks in these pictures…we had to pull the food table into the garage because it was too windy outside, and even in the garage we had paper flying around so we had to tape everything down. The party guests didn’t think anything of it though, so it was still a WIN! For the food table we got a black plastic tablecloth and used dishes in all shades of green….I loved pulling out all my green Fiesta dishes, and I bought a few plastic green serving dishes from the Dollar Store as well. 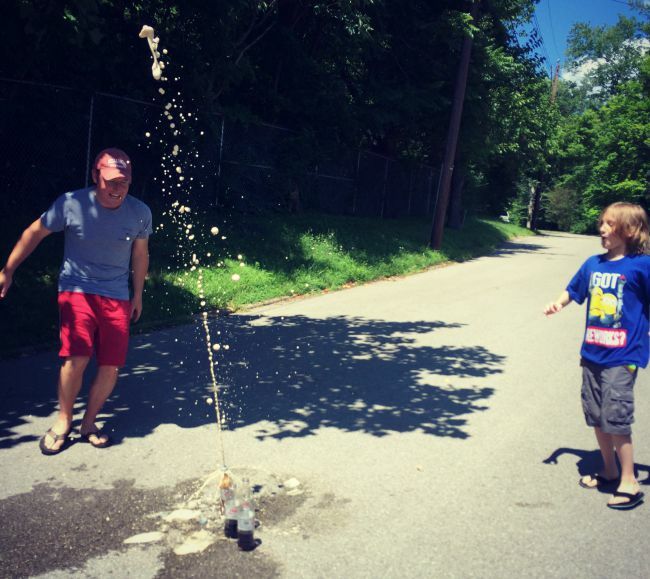 Mentos Explosions: I read some blog posts about parties that included a “crafting table” for kids to make potions and build things and such, but we didn’t have time to put that together. Instead we decided to make some explosions. Mentos explosions that is! 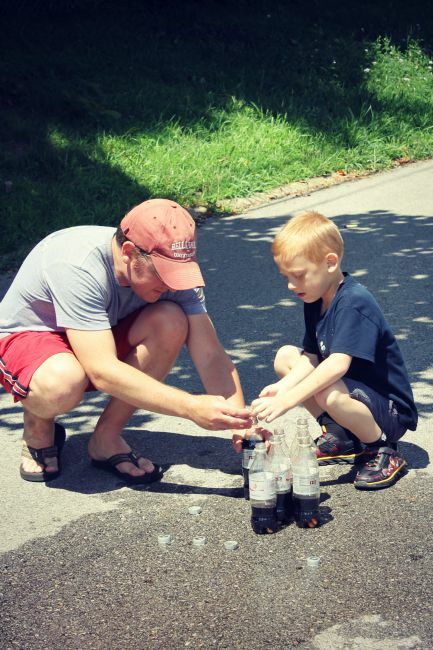 The kids loved doing Mentos + Diet Coke Eruptions in the street. They had a “blast”! 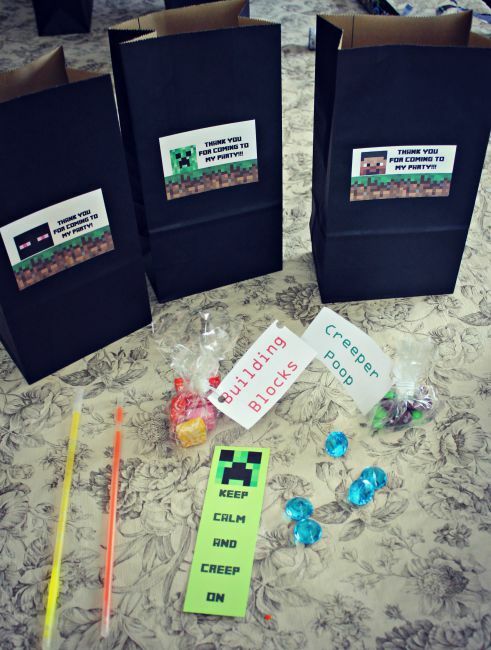 For MORE Minecraft Party Ideas visit my Minecraft Party Ideas Pinterest Board!